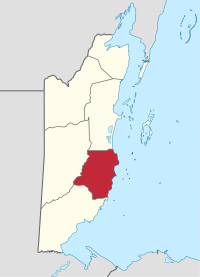 Stann Creek District is a district in the south east region of Belize. According to the 2010 census, the district had a population of 32,166 people. Its capital is the city of Dangriga, formerly known as "Stann Creek Town." Stann comes from "stanns," or safe havens used by colonialists coming from the "old world" to the "new world." Located within the district are the port of Big Creek (the main port of Belize's banana industry), the peninsula and village of Placencia (a popular tourist destination), the villages of Santa Cruz, Alta Vista, Commerce Bight, Dancing Pool, Georgetown, Guana Church Bank, High Sand, Independence and Mango Creek, Kendal, Lagarto Bank, Maya Mopan, Middle Bank, Middlesex, Mullins River, New Home, Pomona, Quarry Hill, Rancho Grande, Red Bank, Regalia, Sarawee, Silver Creek Camp, Silk Grass, San Roman, Sittee River and the Garifuna village of Hopkins. The district is split into two constituencies. They are Dangriga, which contains the town proper and two villages (including Hope Creek and Sarawee) and the offshore islands (cayes), and Stann Creek West, which contains most of the remaining villages including Santa Cruz, Placencia and Independence. The district is served by the Hummingbird Highway and the Southern Highway, connecting to Belize City by way of the George Price Highway at Belmopan. The Stann Creek District is also home to the Cockscomb Basin Wildlife Sanctuary where South Stann Creek rises. Within the preserve is Victoria Peak, the second highest point in Belize, at 1,120 meters (3,670 feet) above sea level. The ethnic Garifuna village of Hopkins has recently undergone a huge transformation due to the growing tourism industry. Placencia is home to one of Belize's most popular tourist destinations due to its large selection of resorts, guest houses, hotels and white Sandy beaches. The Garifuna are direct descendants of a group of African slaves who escaped two ship-wrecked Spanish slave ships near St. Vincent in 1635. They celebrate a diverse and rich culture that is a blend of African traditions of music, dance and religious ceremonies; Native American farming, hunting, and fishing techniques; and a French and Arawak influenced language. ^ "Preliminary Findings of 2010 Census" (PDF). Statistical Institute of Belize.